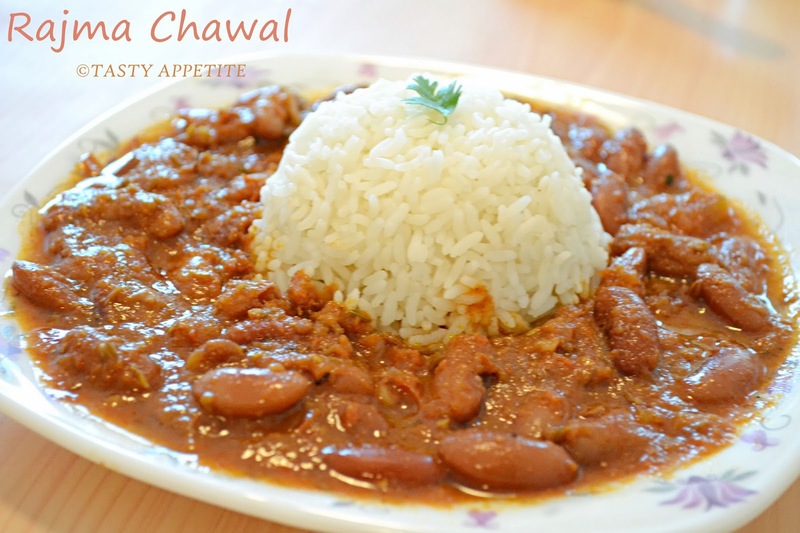 Rajma Chawal is a very famous dish from north Indian cuisine. It is a simple yet delicious meal. I learnt this healthy dish from my neighbor who actually hails from Punjab. It tastes lipsmacking when served hot with steamed rice and now it has turned out to be one of the most favorite comfort foods at our home too. We know Rajma is rich in iron and protein and when it combines with rice, it makes a great source of carbohydrates. 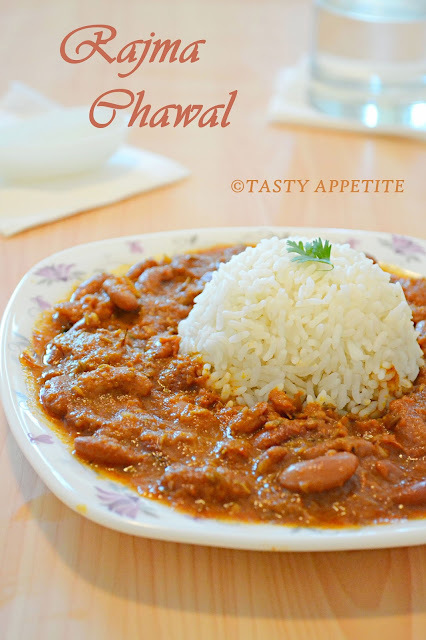 This famous North Indian delicacy is made with red kidney beans cooked in a delicious tomato based gravy and with mild spices and served with hot steaming rice. 1. Wash and soak the kidney beans overnight or atleast for 6 to 7hrs. 2. Slice tomatoes, green chilly, ginger and keep ready. 3. In a blender add tomatoes, ginger and green chilly and grind to fine paste. 4. Heat oil in a fry pan. 5. Add cumin, hing and wait to crackle. 6. 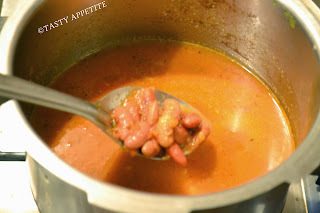 Add the tomato paste and mix well. 7. Allow to cook for a minute. 8. 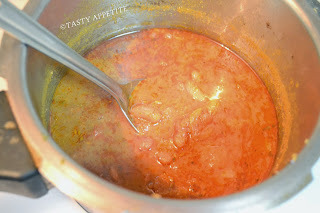 Now add turmeric pwd, red chilly pwd, coriander pwd, pepper pwd and paprika. 10. 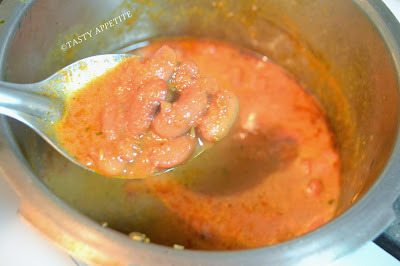 Keep the flame in medium and allow to cook, until the oil separates from the mixture. 11. 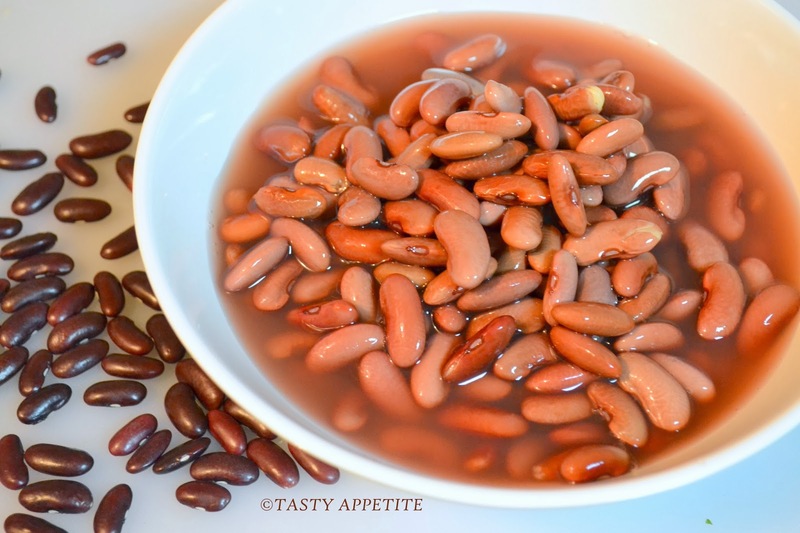 Add the soaked kidney beans along with the water and salt. 12. Transfer the contents to pressure cooker. 13. Add 2 to 3 cups of water or as required. 14. Pressure cook for 4 whistles and simmer for 5 mins. 17. Taste and adjust salt and seasonings. 18. Squeeze ½ tsp of lemon juice and mix. 19. Garnish with freshly chopped coriander leaves. 20. 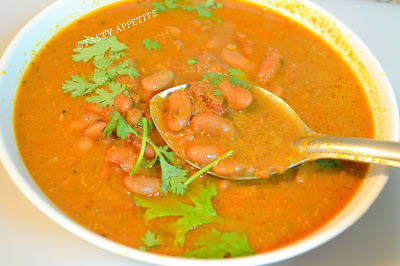 Healthy and delicious Rajma curry is ready. 21. 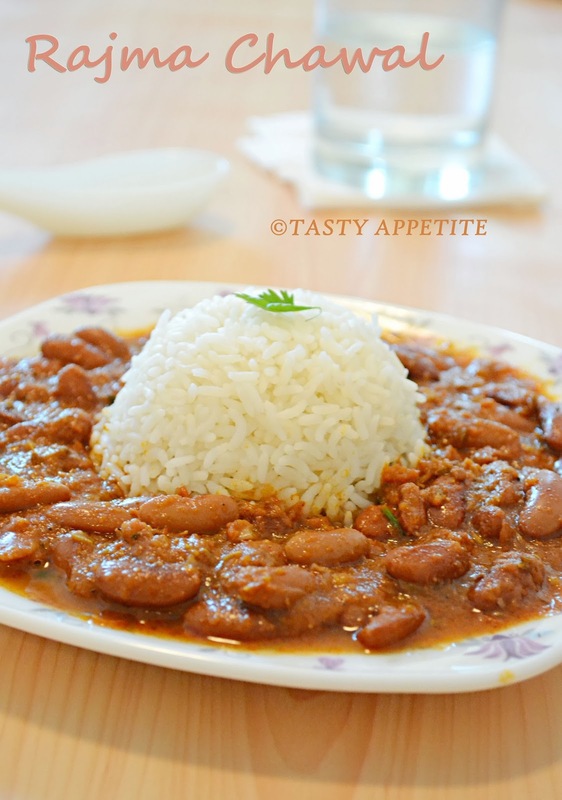 It makes a lipsmacking combo with hot steamed rice. 22. Also it pairs up great with roti, chapatti, naan or parata. 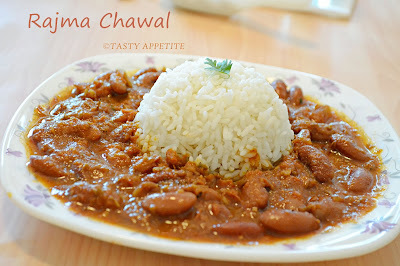 mouth watering rajma chawal with lovely clicks. 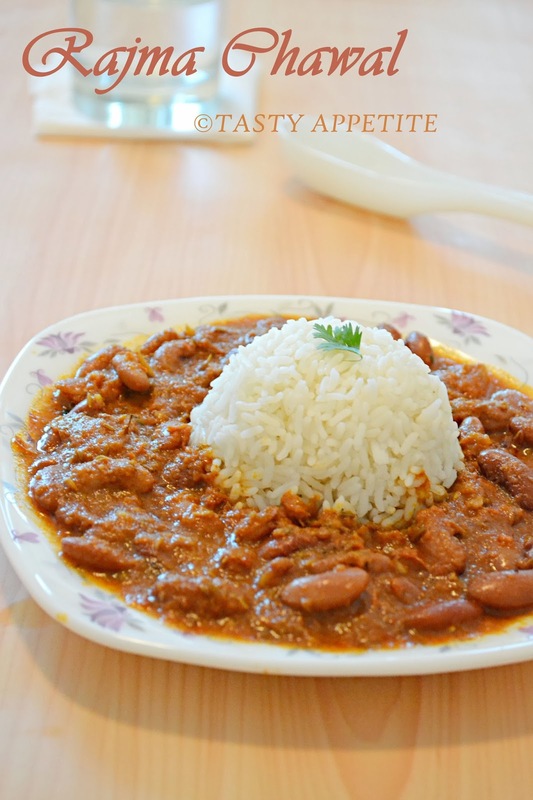 THats one drool worthy curry! !, especially that gravy !!! Jay, This was my staple combo meal when I was in Delhi. Your lovely pics of rajmam chawl have made me feel nostalgic. looks so yummy and lovely pictures.. 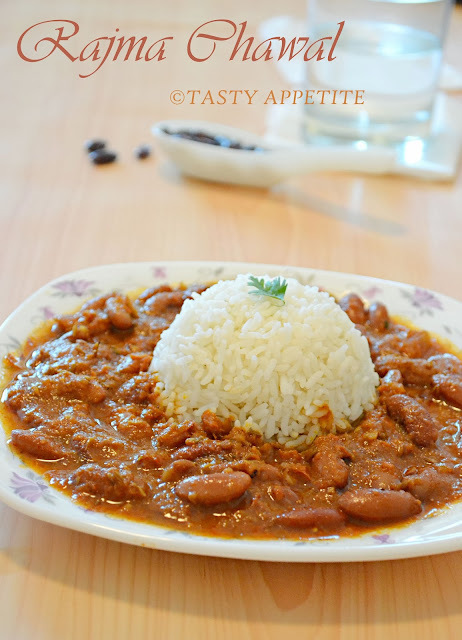 Very nutritious and delicious rajma chawal..
wow such an inviting rajma rice :) looks so delicious yummy dear ! !